Are you looking for something a little different? Do you want your campervan conversion to fit perfectly around your style and need? Whether you need a bespoke campervan conversion to match your quad bike, or you want to be able to play on your x box C and H Camper Conversions have created many bespoke campervan conversions and are ready to help you make your dreams come true. We offer a complete, custom bespoke build from initial concept through to completion. Here at C & H Camper Conversions we have the knowledge, passion and creativity to make your campervan dreams come true. We can take your dream bespoke campervan conversion and make it a reality, offering a few helpful bits of advice along the way from our many years of experience. Whether you are looking to turn your van into a mobile nightclub, a lounge with mini bar or a gaming room on wheels, the sky is the limit and we can make it happen. Let us turn your dream bespoke campervan conversion into a reality. 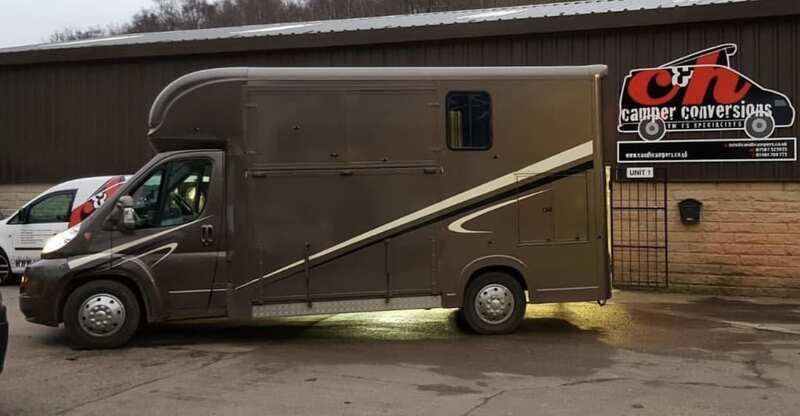 We also offer solutions for the equestrian enthusiasts, we can create a horsebox conversion so you can enjoy a comfortable home away from home for long weekends at the races or travels abroad. In the photo to the left, we created a fantastic horsebox conversion. Homely touches were made to lovely customers horsebox to help make the vehicle more comfortable when going away to events. We carpeted the luton area to create a comfortable sleeping area, we also added some much-needed electrics including a 240v hook up. This has allowed the customer to be able to attend events further away from home by having access to accommodation and being able to use a range of electrical appliances.